SPRINGFIELD – The Double Edge Theatre’s “Springfield Spectacle” was indeed a spectacle. 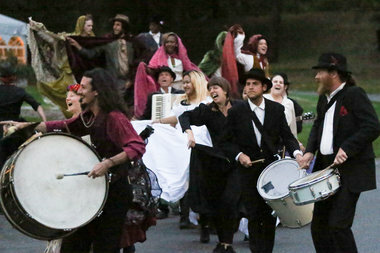 Beginning at the Carriage House at the Barney Estate the audience was led through various sets and scenes within the park to the finale at the amphitheater. Although they were standing in the city, the audience, estimated to be nearly three hundred, were transported to a foreign land rich in culture and captivating music. Prior to the performance local businessman Evan Plotkin, president and founder of City Mosaic, and Mayor Domenic Sarno spoke to the crowd, mentioning the many sponsors who made the event possible. Sarno made special mention of Plotkin, who, for years, has been a very visible champion of the Springfield arts scene. The large-scale outdoor performance featured the Double Edge Ensemble, renowned Argentine guest musicians Manuel Uriona (Bersuit Vergarabat) and Micaela Farias Gomez (Santadiabla) as well as youth performers from Springfield Conservatory of the Arts Public School and students and teachers from Springfield’s Community Music School. This performance project is part of a multi-year initiative that Double Edge has created in collaboration with Springfield schools and organizations. The story follows a traveler who returns to his hometown after many years. Memories of his past and stories about the town’s colorful inhabitants evoke reflections about an increasingly universal theme: how progress can displace people. Inspired by Alejandro Jodorowski and other Latin American writers, the show is imbued with the excitement of a Latin American carnival, and draws upon memory, culture, and song. The event was presented by presented by City Mosaic. Admission was free, thanks in large part to MassMutual, as well as, The Davis Foundation, Taylor Street Dental, C & S Wholesale Grocers, NAI Plotkin, The Springfield Central Cultural District, Tower Square, Metro Care of Springfield, and Inspired Marketing. Additional support for the production was provided by the City of Springfield and the Expeditions Program of the New England Foundation for the Arts (NEFA). There will be another showing of The Springfield Spectacle on Saturday Sept. 24th, at 7 pm.